Why did we trade our backpacks and go bicycle touring? A lot of people are puzzled as to why two middle-aged, overweight backpackers would suddenly decide it’s a good idea to lay down their backpacks and take up long distance bicycle touring. I have to admit, I still sometimes ask myself that question, especially when I’m cycling up a hill into the wind. But trading our backpacks for panniers and pedals is a decision we don’t regret in the slightest. 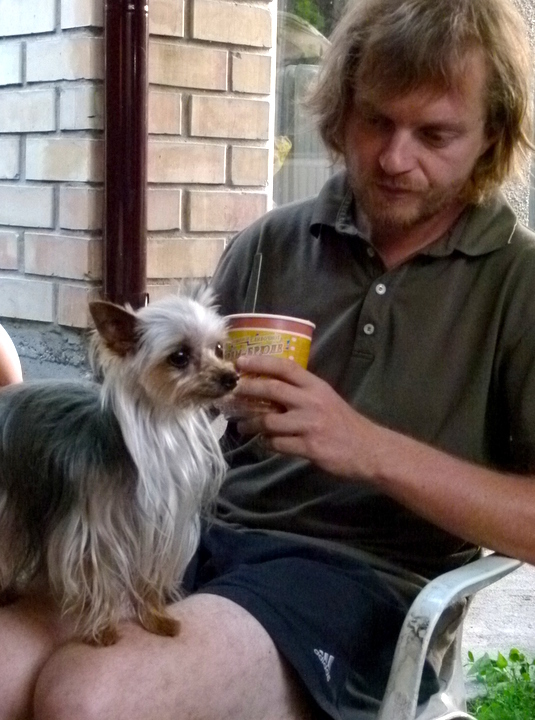 The story began in 2012, in a cool little guesthouse in the centre of Bishkek, the capital of Kyrgystan. I’ll leave my description of Bishkek to another day as where we were staying is the central point of this story. 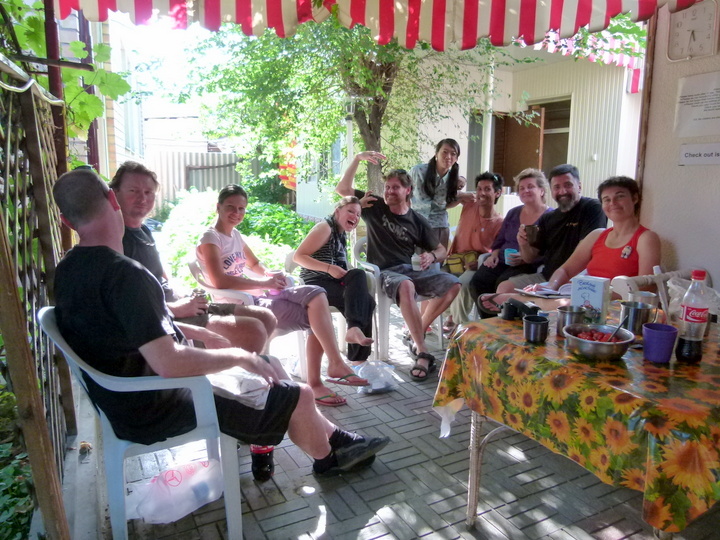 We had settled into the Sakura Guesthouse while we negotiated the Visa system for Uzbekistan and Tajikistan. Everyone who came to the guesthouse was doing something similar, so we got to know many of them quite well. Along with lovely bright, clean rooms, access to spotless bathroom facilities and good Wi-Fi, it also has a small community area in the garden. The weather was fabulous, so we spent much of our the time there when we weren’t out exploring. We had intended to stay around 4 or 5 days and ended up staying 10, solely because of the amazing people we met and the stories they had to tell. And here’s the rub….they were almost all bicycle touring. The characters that played a large part in this story were all very different. But they all had a sense of adventure, a positive attitude, a talent for telling stories and a love of life. Tomoko, a Japanese girl, bought a cheap bike in Kashgar and then rode it over to Kyrgyzstan. 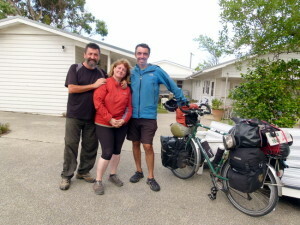 Two couples, Marty and Alex (Australia) and Sergai and Adrienn (NZ/Hungary) had pedaled from Britain and had clocked up over 12,500kms each. Eireen and Michael from Berlin were cycling with Lucia, a tiny Yorkshire terrier who commanded centre stage every time we sat down. Wataru (Walter) was a tall lanky Japanese boy who’d ridden across China and had a penchant for taking crazy superhero videos in places he stopped. Dia from Greece and his Japanese partner Yayoi were delightful youngsters on a rock bottom budget, crazy cheap bikes, and a talent for magnificent photographs. There were others we met before and after Sakura like the very laid back Yannick from Switzerland, Ethan from Taiwan and the legendary Jacques Sirat from France. We are still in contact with them all and they are all still having adventures of one sort or another. We spent our nights at Sakura with a couple of beers quizzing them about bikes, gear and training regimes. It soon became apparent that while a lot of planning (in some cases!) had gone into equipping their bikes, many of them had just gotten on them and started riding, gaining fitness and losing weight as they went. They also took time out to show us their bikes and riding gear. They were as varied as the riders. While Rohloff hubs and Brooks saddles were amazing, the youngsters were proof that you didn’t need to spend a lot of money to go cycle touring. Surprise meet-up with the legendary Jacques Sirat. 20 years plus on the road. After six years of backpacking, the shine had started to wear off. Technology had taken much of the camaraderie away, and everything was just a little bit too easy. When we began to travel in the late 90’s everyone relied on guest books and other travellers to leave and receive tips. These days, people just go to an app. Who needs to talk to each other? But this group of travellers were different. They had a spark that seemed to be missing from some of the current generation of backpackers. 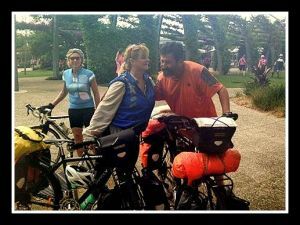 They blew away our perceptions of who and what you needed to be to go cycling around the world. None of them were exactly health enthusiasts. In fact just the opposite. Many of them loved beer and a good percentage of them smoked. When we finished the silk route in Turkey, we had plans to spend ten months in Africa. After that, we hadn’t decided. One train of thought was to head north to Cyprus and then up through parts of Eastern Europe as long as the weather stayed bearable and then get a job somewhere warm. The expense of Europe precludes travelling around for too long without transport! Bicycles were just about the cheapest form of transport you could get, except perhaps for hitchhiking. Catching up and swapping stories – Marty and Alex. Part of the Sakura crew. 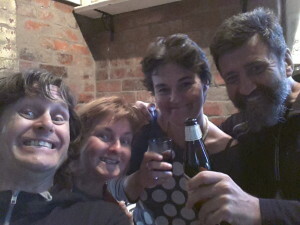 I wouldn’t say we loved EVERY minute of the 7000km trip across Australia, BUT we did have a ball overall. The physical and mental challenges were quite significant, considering our age, weight and fitness levels. But the satisfaction at the end of each day, the amazing interactions we had with people from all walks of life were more than enough to compensate for a few hard days in the saddle.The fact that many of those who inspired us are still cycling to this day was also a motivating factor. We were blown away by the kindness people offered to us and the amount of people that just wanted to chat, say hello and offer us words of encouragement. It returned the spark to our travels and renewed our faith in our strength of character.As a constant reminder of the place where we got the best idea in ages, I named my bike Sakura. Tim’s is named Radmilla…but that’s another story! And….coming this May, we’ll be back to do it all again. This time in Eastern Europe. We’ll be starting in the Arctic Circle and then head down to the Baltic States, Belarus, Moldova, Romania and the countries that were formerly Yugoslavia. Watch this space to find out how we complete our plans, the lessons we learned, the gear we buy, general tips on bicycle touring for newbies and all the places we visit along the way. Next story Bicycle Touring in Lapland – Cycles and Sails (Pt 1). Where are we now and what are we doing? Cheap, Cheap Wine and Lots of Lovely Beer!